Our core group got together to celebrate our friend Eric’s birthday at Tarara Winery in Leesburg, Va. (Chhayal, Chris, Pascale, Mary Lou, Seetal and Amelia). We kicked off the festivities in the wine tasting room. A staff member guided us through the tasting experience — helping us identify the unique flavors and understand the complexities in each vintage. We choose to participate in the Featured Selection, which included five wines: 2006 Charval, 2007 Rosé, 2005 Cabernet Franc, 2005 Cabernet Sauvignon and Non-Vintage Wild River Red. 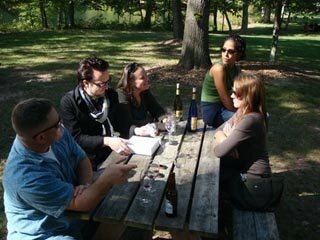 After the tasting we headed over to picnic tables overlooking a lake to have lunch and enjoy some bottles of wine. It was a beautiful autumn day. The house dog Shadow, a sweet black lab, came over to greet us. Everyone brought a different item to contribute to the picnic. On the spot Eric cut tomatoes and stuffed them with homemade chicken salad. The spread looked like something right off the pages of Martha Stewart Living. We ended the afternoon with a delicious chocolate birthday cake Chhayal made from scratch.